Learn about dermatofibroma, including symptoms, causes, treatment options, and when to seek consultation. Or take a quiz to get a second opinion on your dermatofibroma from our A.I. health assistant. Symptoms include a hard, raised growth that is red, pink, or brown and less than half an inch across. They are usually painless but may be tender or itchy, and may appear alone or in groups. The diagnosis is made through physical examination and sometimes biopsy. A dermatofibroma does not require treatment unless it is interfering with clothing or is unsightly. They can be surgically removed, though this will leave a scar and the growth may eventually return. Any new growth on the skin should be seen by a medical provider, especially if the growth is very dark in color or changes its shape or appearance quickly. You do not need treatment for this condition because it is completely benign; however, if the lesion changes at all, a doctor should be consulted. If you would like it removed, a doctor can cut, freeze, or burn it off. Hard, raised skin growth on the lower legs: The growth may feel like a smooth pebble stuck to the skin that is most often found on the lower legs, but can also be found on the upper arms and trunk. Very small: Dermatofibromas rarely larger than a fingernail, usually 0.5 to 1 cm in size. Painless: They are usually painless but can be associated with tenderness or itching. 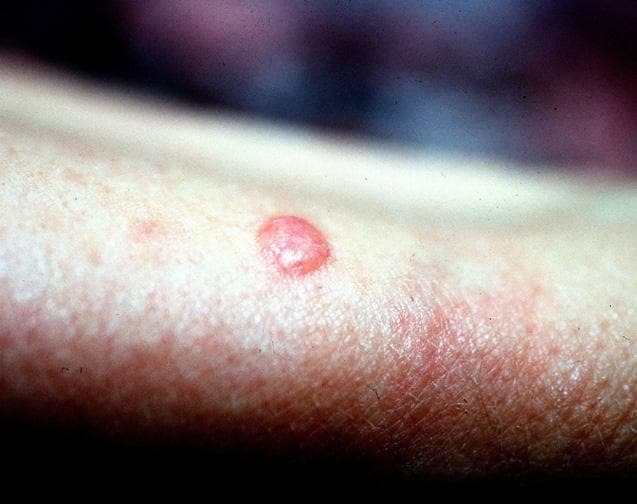 Dimples when pinched: This is a common, often characteristic finding of dermatofibromas that is useful for diagnosis; however, this sign does not have to be present in order to diagnose a dermatofibroma. Slow growing, single growth: Dermatofibromas are usually solitary; however, some people may develop multiple that generally do not go above 15 in number. Causes of dermatofibroma are not entirely understood, but may be related to trauma or spontaneous cell growth. Suppressed immune systems: Individuals who have this trait may be at greater risk for dermatofibromas . Trauma: Some researchers think that dermatofibromas occur at sites of trauma, like a cut or a bug bite. Benign growth: Other researchers believe that they are caused by a benign spontaneous growth . Dermatofibromas do not go away by themselves. Dermatofibroma is a chronic finding that remains for life unless it is surgically removed. Inconvenient location: For example, if the dermatofibroma is located in an area that is continuously irritated by shaving or clothing. Since some dermatofibromas can grow deep into the skin, it is important to ensure removal below the skin's surface. Shaving the top of the nodule with a surgical knife may only remove the top layer of the dermatofibroma and miss the deeper layer. This can cause the dermatofibroma to grow back again later after several years. If you notice significant changes in the color, size, or border (irregularity) of your skin growth or if your skin growth bleeds or become painful, seek prompt medical evaluation. These symptoms may signify an aggressive subtype of dermatofibroma or an alternative diagnosis that requires workup. Zaccaria, E, Rebora, A, Rongioletti, F. Multiple eruptive dermatofibromas and immunosuppression: report of two cases and review of the literature. International Journal of Dermatology. 2008; 47(7): 723-7. Published July 2008. Int J Dermatol Link. Dermatofibroma: what is it? Harvard Health Publishing. Published Sept. 2000. Harvard Health Link.